Well, I couldn’t not post today! The biggest day of my (writing) life. How does it feel to be a published author? At the moment, somewhat dazed, or is that the hangover? Not that I’ve had much to drink, but I’m not used to Champagne (OK, Spanish Cava) at eleven in the morning. I stayed up last night, to “see” the moment that my book was born. 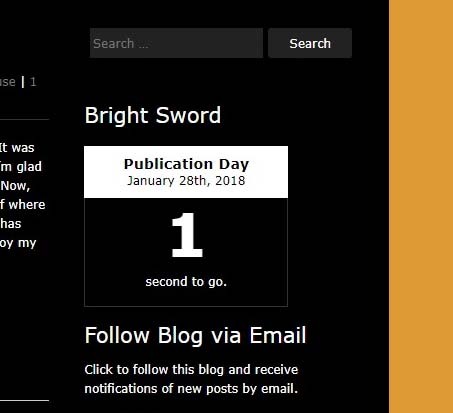 About a month ago, I set up a useful WordPress Widget to count down the days. 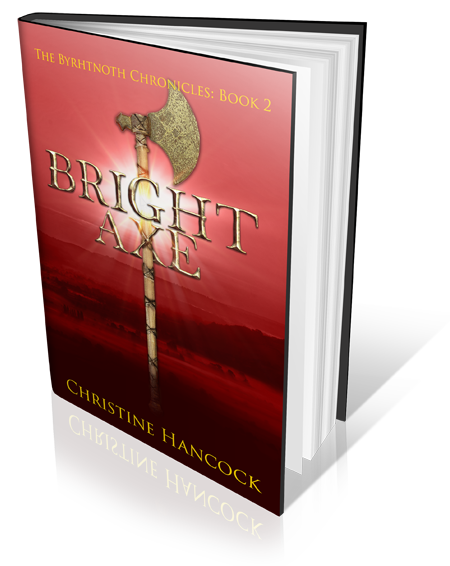 It’s that box on the right (or elsewhere if you’re reading this on a smartphone) that says “Bright Sword is published!”. As I sat there, in a draughty hall, I found that the final hour counted down in minutes, then the final minute in seconds. It was just like New Year, but without the fireworks! I checked Amazon and there it was – In Stock and ready to “Add to Basket.” Sorry it’s not expensive enough to warrant Free Delivery. I checked for reviews – none yet, but early days, people have got to read it first! Actually there is one review on the Ebook edition, which crept out a few days before the paperback. 4 stars, so not a bad start. Thank you M J Porter. I tweeted the good news to the world and sat there a while. I wanted to remember the feeling. I imagined huge lorries thundering through the night, filled with copies of my book, to deliver to readers queued outside bookshops – I’m a fiction writer – I’ve got a vivid imagination! It was emotional. I could have cried, but didn’t. Then I went to bed. I woke up this morning, and like New Year, nothing had really changed. Breakfast, check e-mails etc, a couple of people had “liked” my midnight tweet. Later I went to visit my mother. I took a signed copy of the book and the Bubbly. I had dedicated it to her. If she hadn’t encouraged me to read, taken me to join the library at an early age, I would never have discovered books and eventually write one myself. I’m sorry it took so long. Her eyes are now too bad to read it and if she could, she wouldn’t remember what she had read. But this morning she knew what I had done and was pleased. By coincidence, 28th January was my father’s birthday. He died fifteen years ago. I hope he would have been proud too. This afternoon I was going to write, not book three, I have a deadline for a family history article, but somehow I wasn’t in the mood. I have a book signing next Saturday (3rd Feb, 11.00-2.00, at Hunts Bookshop in Rugby – if you’re in the area. I have promised Anglo-Saxon Warriors and a Mead Tasting. The autumn before last I made some mead, I wrote about it here. I have tasted it occasionally, to toast the progress of my writing, it is quite drinkable – and alcoholic! It was time to bottle it. Then I decided it needed a proper label. By then, there was not much time to write, except this blog post. What with everything else I managed 1627 words on Monday, then nothing else. I’m not sure when I’ll continue. I really should get back to editing book 2. I can’t stop now, I’m a published author. ← How I started to write. Congratulations! And I like the sound of that mead! Congratulations! Now, where’s my mead?! P.S. I’m sure you dad would have been proud. Any time you’re passing, call in and I’ll give you a glug from my demijohn!